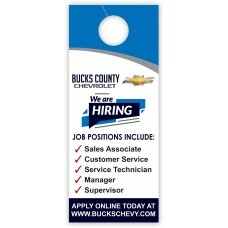 Our Mirror Hang Tags for auto dealerships are made from durable paper stock that resists curling as they hang on the rear view mirror of vehicles. 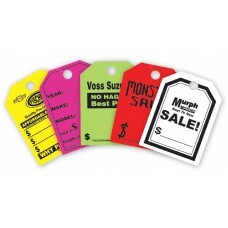 Our most popular product in this department is our promotional hang tags which are offered in five colors: fluorescent yellow, fluorescent red, fluorescent green, fluorescent pink, & white with sales-oriented messages like "Red Tag Sale", "Was Now", "Sale", "Clearance" and more. 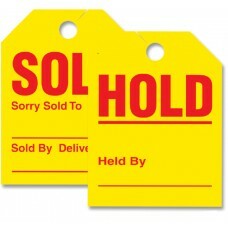 We also offer Sold/Hold Tags which are printed in red ink on yellow stock and indicate that either a vehicle has already been sold or that it is being reserved for someone. If you do not see the mirror hang tag you are looking for, we are able to custom print them on your choice of paper stock with your logo, company name, or promotional message. 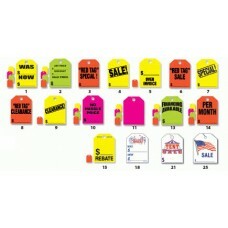 Custom Printed Service Hang Tags - 3 2/3 in. X 8 1/2 in.